Facet is designed to be an eye-catching piece of furniture while fulfilling a specific function. It can be used as a TV wall design piece to separate your TV area from the rest of the living room or to minimize the glare that can be seen on the TV screen, all while adding the finishing touch to your interior decoration. Add a personal touch to your tv wall design. Form and function come together in the mesmerizing pattern of our room divider, Facet. 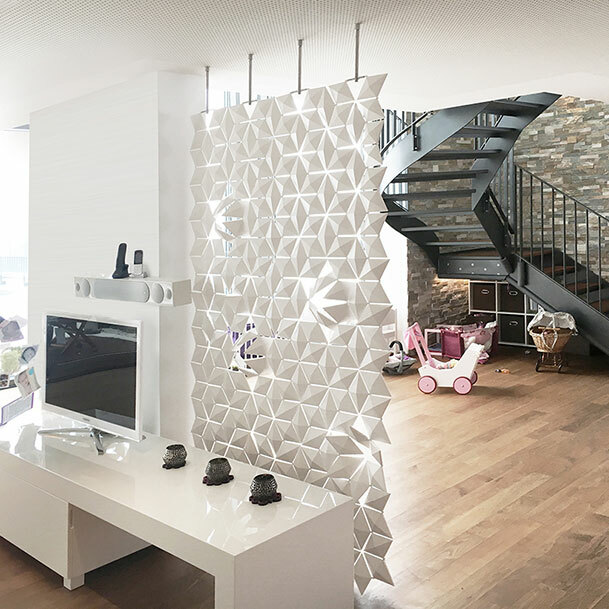 This pattern is created by the diamond-shaped facets that are connected to form the screen of the room divider. These diamond-shaped facets are mobile: they can be turned around their axis. This gives every owner of Facet the opportunity to adjust the look of their screen. You can open up parts of the screen to let more light through or adjust it to add your personal touch. With Facet as your TV wall design, you have a stylish and unique piece of design furniture in your house. There is no need to feel apprehensive about installing Facet in your living or cinema. We designed Facet in such a way that it can be attached to any type of ceiling. It is a sturdy, yet ultra light object that anyone can install by themselves. You will receive a simple manual with a step-by-step explanation of how it should be installed. We are also available if you have any queries regarding your newly purchased TV wall design. 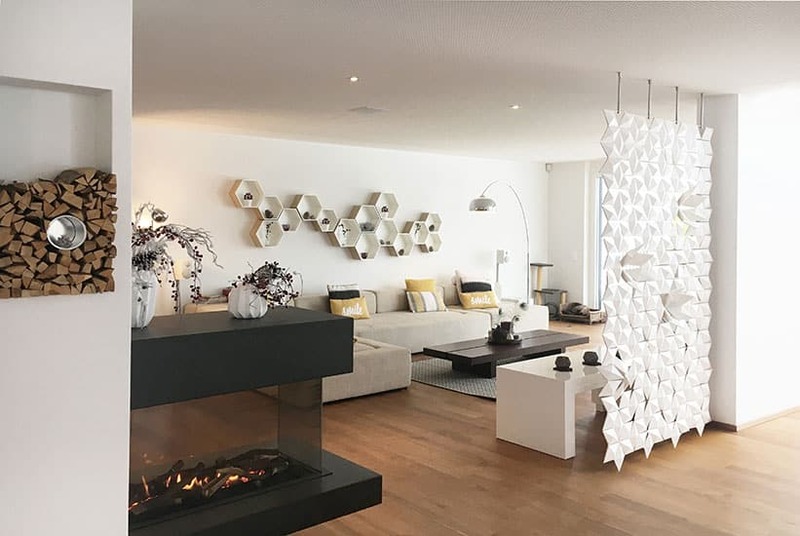 Featured on this page is the tastefully decorated living room in a home in Hergiswil, Switzerland. Facet completes the entire look by providing an interesting pattern and texture to the TV wall design. See also how they have arranged the facets. They chose a few clusters of facets and turned them slightly. This results in several star-shaped openings on the screen. By turning the facets, they have created a one-of-a-kind room divider. Very pleased with this clever and very nice product. Easy to order speaking directly to Bas. Easy to install, playing with all facets as much as you want to. Nice stainless steel supports. To recommend! Progressive sharp angels in spaces and furniture with the room divider facet by Bloomming. Optical illusions allow abstract lines and shapes to magically transform into string patterns. Facets form complex mosaic patterns, angular silhouettes and facetted outlines. During the yearly convention 100% Design in Rotterdam, the remarkable room divider Light Facet, designed by Bas van Leeuwen of Blooming is a real eyecatcher. It is a unique system which can be used as blinds or as a a room divider.